Greek Prime Minister Alexis Tsipras was sworn in as foreign minister on Saturday, following the resignation last week of Nikos Kotzias over acrimony with the head of the leftist-led government's coalition partner and defense minister, Panos Kammenos. 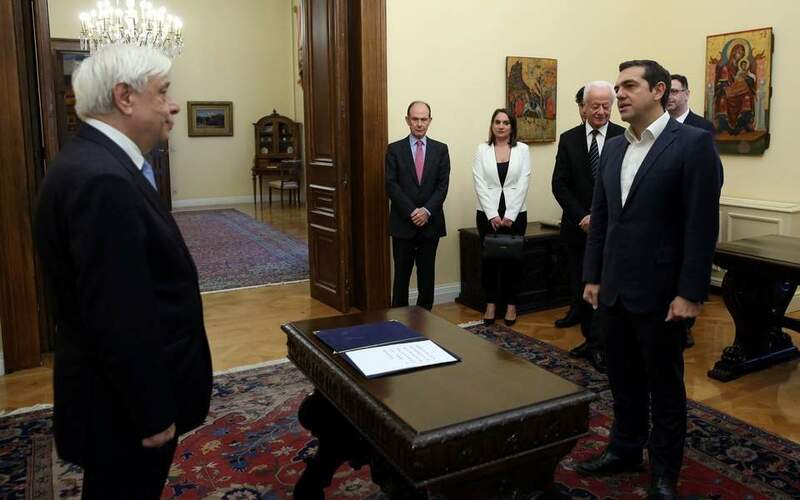 Tsipras was sworn in by President Prokopis Pavlopoulos and was then met at the Foreign Ministry by Kotzias for the official handing over of the portfolio. “Today is a symbolic and historic day after the decision at Skopje's Parliament which opens the way for the implementation of the accord,” Tsipras said during the ceremony. “I am experiencing the paradox of having quit and being happy,” Kotzias said, referring to the passing of the name deal with the Former Yugoslav Republic of Macedonia by Parliament in Skopje on Friday night. Kotzias, who was the key negotiator in the agreement signed at Greece's Prespes Lake district in June, described Friday's vote by FYROM lawmakers as a “step forward,” and thanked Prime Minister Zoran Zaev, Foreign Minister Nikola Dimitrov and the 80 MPs who voted in favor of the deal.